I am born and raised in Boston. And I am really into the Red Sox. (I’m wearing Ellsbury jersey right now) So naturally I was crushed when the Angels swept the Sox. I felt pretty embarrassed. So being a Red Sox fan, I naturally rooted for the Angels to beat the Yankees. And now I really want the Phillies to repeat just so the Yankees lose. I’m not alone according to a (biased) poll on boston.com. 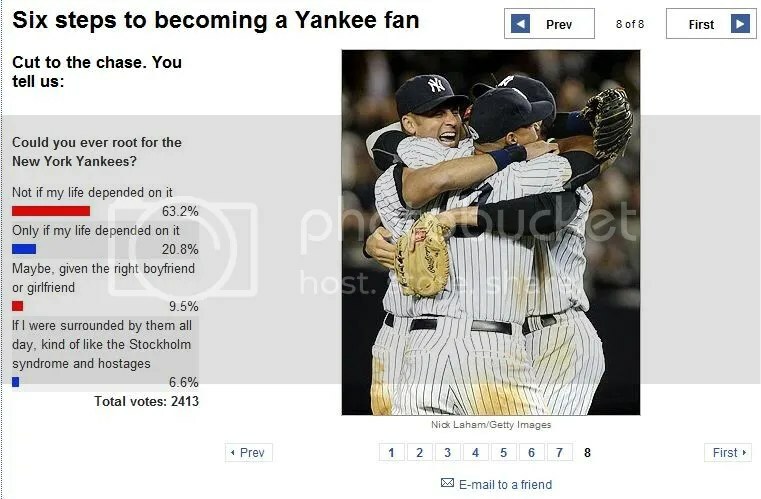 They asked Red Sox fans how willing they were to root for the Yankees. Can you guess what I voted for? I voted Not if my life depended on it. I am not bold enough to go prancing around Manhattan with my jersey on, but I have seen a Sox/Yanks game in the new Yankee Stadium and have proudly worn my jersey there. But I found an article on mlb.com which throws the term “Team of the Decade” around. The debate is heating up. And the Yankees, Red Sox and Phillies are all in contention. Both the Yankees and Phillies have won a World Series in this decade (00-09) The Red Sox are the only team that has won two. (04 and 07) So either team would tie the Sox. If the Yankees win, then most baseball analysts would pick them for the unofficial title. But if the Phillies win, then most of them would pick the Sox. Also, in some analysts’ eyes the miracle in 04 (where the Sox came back from 3-0 deficit against the Yankees to sweep the Cardinals in the Series) is a more impressive feat than what either the Phillies and the Yankees have accomplished this decade. The fact that the Sox were able to do something similar (coming back from 3-1 against the Indians) in 07 to sweep the Series again only strengthens that opinion. The Yankees have not won a World Series since 2000 and I would like to keep it that way. I think it stems from being constantly reminded of the Red Sox 86 year old drought before they broke it in 2004. I want the Yankee fans to go at least 10 years without a title, to get a little taste of a drought. But I do appreciate good baseball. It’s just hard to watch when I’m not invested in rooting either for (or against) a particular team.